500,000 pounds! Pretty dramatic weight loss for an event that in 2011 weighed 1.8 million pounds. In 2011, when Oracle OpenWorld began measuring the carbon footprint of onsite logistics, the event produced 828 metric tons of carbon dioxide equivalent emissions. That’s equal to the impact of 174 cars driven for a year. By 2012 this number had climbed to 1015 metric tons. An increase of 39 cars. Following a major regrouping by the event green team in March 2013, event emissions have settled back down, dropping by 27% compared to baseline, and 41% over 2012. Onsite carbon emissions are a key indicator to use when trying to measure and reduce the impact your event has on the environment. In addition to the weight of emissions, impact can be measured in financial terms where cost-of-carbon thinking is adopted. In the US, the federal government estimates the public cost of rising temperatures to be $37 per metric ton of carbon. That puts the value of Oracle OpenWorld’s carbon reductions at about $8,400, over and above any direct cost-savings from reducing energy use. How did they do it? And what you can you take away to reduce the carbon footprint of your event? Carbon-conscious destination selection. San Francisco (the host city for this event) and the state of California have among the lowest emissions factors in the US, putting the region at an advantage for hosting lower carbon meetings given prevailing power sources. Designing a walkable convention neighbourhood. 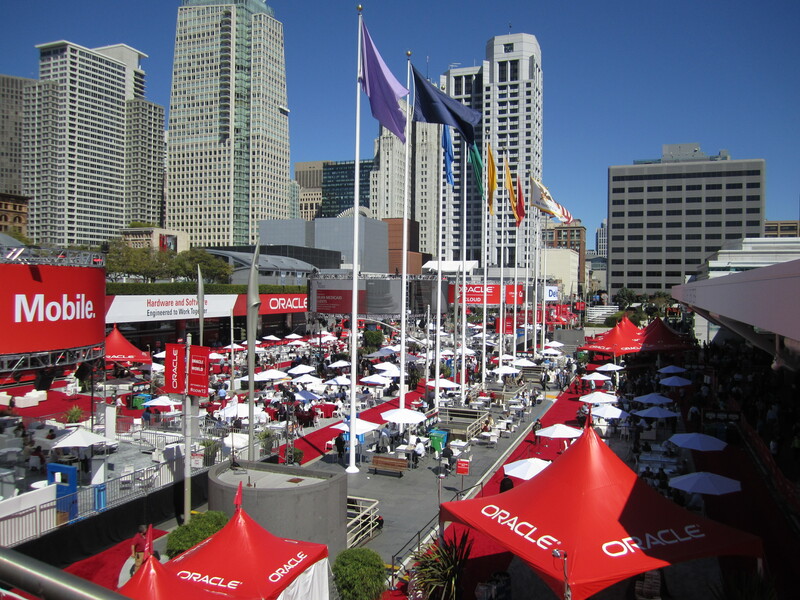 Walking hotels comprise 46% of housing for Oracle OpenWorld, which hosts over 111,500 room nights. The portion of walkable housing has increased each year as attendees are encouraged to stay at walk-friendly and transit-connected properties. Efficient venues coupled with efficient use of them. Not only are two venues LEED-certified with low or zero emissions power sources (shout out to the Intercontinental Hotel San Francisco and Moscone Center), but every last inch of meeting space is used. In fact, reduced power use across event venues was a major contributor to dramatic reductions between 2012 and 2013. Reducing onsite shuttles. Fuel use by attendee shuttles has dropped by 5,393 gallons, or 50%, since 2008. This while attendance has continued to increase! Promoting transit use. 2,532 BART passes were purchased by attendees in 2013, each trip preventing 21 pounds of emissions. Reducing onsite waste. Reducing landfill reduces event emissions, and this event generated 33,000 fewer pounds of landfill in 2013 through a variety of waste reduction and diversion efforts. In fact, waste intensity per attendee has dropped by half a pound per person, overall. There is definitely still room for improvement. Organizers continue to target waste, and look for ways to reduce emissions from fuel use for onsite generation and shuttles. Show management freight, which has increased the last two years, is also being targeted. In addition, Oracle takes responsibility for 100% of unavoidable onsite emissions by purchasing offsets from Terrapass. Attendees also voluntarily purchase offsets for their own travel to and from the event, offsetting an additional 6,330 MT of carbon emissions in 2013. Together, this represents about 15% of all event emissions, including delegate travel. Dramatic carbon reductions are possible for events where you scope for those logistical aspects you can control and influence, and take common sense steps to improve your systems and provide opportunities for attendees to take their own action. The key to evaluating the impact of these actions is setting a baseline and consistently measuring the outcomes of your actions. What’s your event’s carbon weight-loss plan? Onsite logistics scope includes emissions from energy use and waste produced at all event venues, portable generation, attendee shuttles, and show management freight.